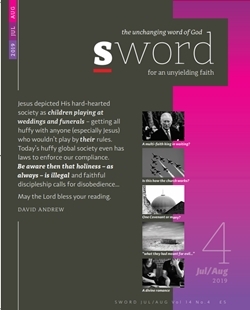 Sword magazine is a bi-monthly Christian printed publication promoting 'the unchanging Word of God for an unyielding faith". It is for Biblical Christians who are serious about their faith. CLICK HERE for a sneak preview. Annual subscriptions are £30 (in UK) but from February 1st 2018 until further notive we are happy to offer £10 off a standard annual subscription to the printed magazine for those who subscribe to the Saltshakers network. Click here to see the advantages for doing so. This includes access to the growing digital library of back issues. Isaiah shows God's mercy triumphing over His judgments, by describing the time of His gracious acceptance as a 'year', while His vengeance is seen as a 'day'. We are in that day now. We didn’t think that we could improve on our March conference in Grange. We were wrong. Sometimes God turns up unexpectedly in surprising ways. We had great expectations for Foundations 10 in Devon a few weeks ago, but nothing could have prepared us for what happened. Choices have consequences – what if you don’t choose life…? So what’s our part in the battle, if we already have the mind of Christ? Is the renewing of our mind solely the work of the Holy Spirit? Iraq’s Christians continue to suffer hardships persecution and discrimination - and urgently need our support. I started campaigning for Iraqi Christians in 2003, shortly after the US-British invasion of Iraq. Soon after that event Islamic extremists started to conduct ruthless, relentless attacks against Iraq’s Christians. In His time, God reckons with rebellion. Bible patterns afford stark warnings for our day. Satan’s final kingdom will be used to separate the righteous from the wicked. But who are the 144,000 standing with the Lamb on Mount Zion? This is the seventh article in the series ‘12 Revelations of Jesus Christ’ from the book of Revelation. In the previous instalment we looked at Christ and Israel. He still loves the Jews and will protect those who obey Him in these last days. We also saw how that the martyrs for Christ directly contribute to the downfall of Satan. On average over 500 unborn children are killed by abortion every day in the UK. In the past 50 years, that figure has reached 9 million lives destroyed. Prime Minister Theresa May has stated that she does not agree with Diana Johnson MP's proposed abortion decriminalisation bill. The Prime Minister reiterated that locally elected politicians in Northern Ireland must decide on the issue there. A tale is told of William Wilberforce, the great parliamentarian who committed himself to abolishing the slave trade. Wilberforce was a passionate disciple of the Lord Jesus and when he heard the Scriptures expounded in a manner that made much of His Saviour, his heart would leap. It was none other than the witness of the Holy Spirit within him glorifying Jesus, his Messiah. He longed for his friends to know Him too. For many, the thought of commitment in love brings fear of failure, entrapment or betrayal. But unswerving commitment is made possible because we are not alone. We have a helper, and with Him we can have confidence because we recognise that we are not our own. Further evidence of how the Universe evolved? Or further contradictory theories denying the great Creator? In 2020-21 it is (almost) certain that ‘life’ will be claimed to have been discovered on Mars. This ‘discovery’ whether real or false, will serve two principle purposes in our age: (1) it will justify and impel further financial investment in the progression of such ‘knowledge’ and (2) it will be used as an affirmation of the various, if often contradictory, theories of evolution. Your terrified jailer wants saving… how would you help him? Issues around the meaning, message and method of salvation – and especially the direct questions of how one can be saved - is a major theme of the book of Acts. This question shapes much of Luke’s narrative, so how we understand and apply the teaching from Acts today will govern much of our mission and ministry. Theresa May has used her Easter message to offer support to Christians around the world who face "huge danger" because of their faith. The Prime Minister said "we must stand up for the right of everyone, no matter what their religion" to follow their beliefs. Mrs May, a vicar's daughter said that while she will spend Easter "giving thanks in church", "for many Christians around the world, such simple acts of faith can bring huge danger". She added: "Churches have been attacked. Christians murdered. Families forced to flee their homes. "That is why the Government has launched a global review into the persecution of Christians.